Posted earlier by a friend of mine who wishes to rant anonymously: "Here's Fox News terrorizing its audience with some "imminent disaster" hysteria. 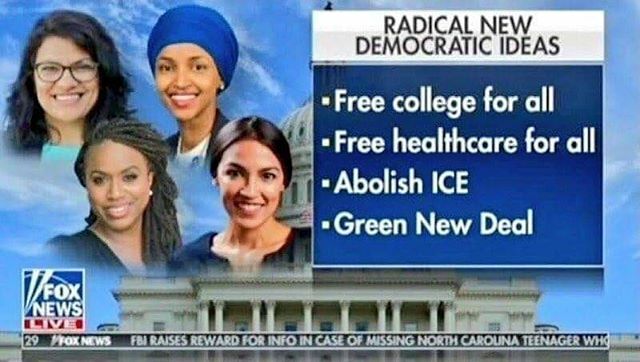 Now, it's one thing if you want to discuss the policy changes that would be required to shift funding and ensure a return on investment for some of the bullet points (the Green New Deal is non-negotiable; only myopic idiots couldn't find a way to grow businesses that might also save the planet). "But the other thing Fox is doing with this graphic is screaming, "LOOK OUT, THERE ARE WOMEN OF COLOR SEIZING POWER. THE WHITE MALE HEGEMONY IS AT RISK." "Tell me we don't have a goddamn terrorist organization running amok in America, with 2.5 million people being radicalized — and it ain't Antifa."